Fifth Graders at Barnett studied American History all year long. As an end of the year project, students chose a famous American and learned all about them. They then reported on them and presented what they had learned to their classmates. We love learning about leaders! Barnett was excited to celebrate all the hard work our Kindergartners have accomplished this school year at their graduation on Friday, May 19th. The students performed songs and pledges that they had been working on all school year. Congratulations to these awesome students and a big thanks to the teachers and the parents for helping get off to a great start in their school careers! We also gave a special thank you to Mrs. Comte, Mrs. Evans and their grandma helpers who work so hard for our students. In fourth grade students learn about Utah history. As part of a unit on pioneers, the fourth graders at Barnett Elementary had a pioneer day. The students started the day by learning about the territorial house in Fillmore. They heard stories about pioneers and learned that even pioneers occasionally played pranks on each other. Then the students got to work. Students learned how to weave, make butter, rope and candles, saw and plane wood, chisel stone, create pioneer toys and how to card and spin wool. The students quickly realized that being a pioneer was hard work! Then students learned what pioneers did for fun. They learned pioneer dances and played pioneer games. It was a very fun, busy day. 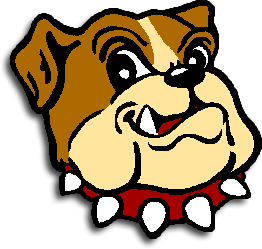 Barnett Bulldogs celebrated their Bulldog Pride on April 28th, 2017. We love getting together as a whole school to celebrate all the wonderful leadership things we are doing! Picks of the Pack: Mrs. Peterson's 6th Grade Class, Mrs. Tingey's 5th Grade Class, Mrs. Johnson's 4th Grade Class, and Mrs. Chapman's 2nd Grade Class. Barnett Bulldogs hosted a "Penny War" for students to raise money to donate to the Quentin Muir Scholarship Fund. Quentin, a former Bulldog, passed away from cancer. The Muir Family created a scholarship fund in his memory. Barnett Bulldogs wanted to help. They donated over $2400 to the Muir Family! Please click below to read our May Newsletter.